In Madagascar, a big game hunter shoots down the last of the blue elephants. Bagging it as a trophy, he tells his assistants that he’s sick of such typical game and wants something more challenging. Looking at a newspaper clipping about a large alligator in the sewers of New York, Marlin climbs into his helicopter and takes off. Shortly after he leaves, a military officer curses that once again, the poacher has escaped. Finding the newspaper clipping, though, he vows to give chase. In the alleys of New York, the Turtles fight against a unit of Foot Soldiers. The ninja retreat, but Leo knows that they will return in greater numbers. 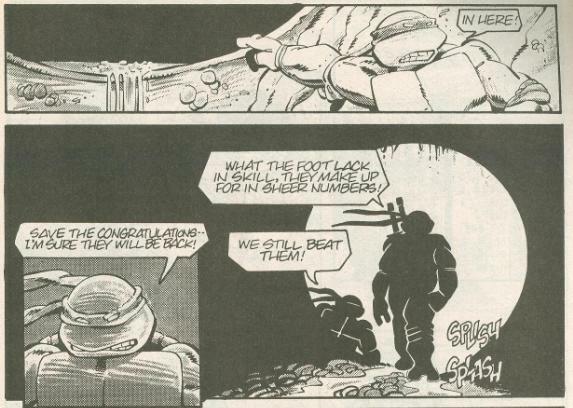 The Turtles retreat into a sewer pipe, not knowing where it will lead them. As they traverse the unfamiliar tunnels, they fail to notice a creature observing them from beneath the murky water. Outside another sewer pipe, Marlin packs his gear and orders his assistants to await his triumphant return at the hotel. After Marlin enters the tunnel and the assistants drive away, the military officer comes out of hiding and follows. 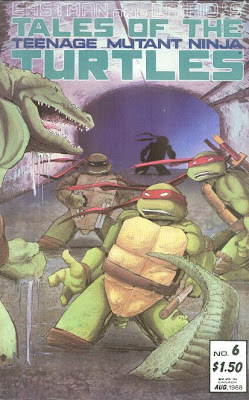 In the sewer tunnels, the Turtles make the mistake of bumping into Marlin. Deciding that four giant turtles would make for an even greater trophy, Marlin opens fire with his machinegun. Knowing the arena is too cramped for them to make a stand against automatic weaponry, the Turtles make a break for it, only to round a corner and find themselves looking down a unit of Foot Soldiers. Leo orders Mike to watch their rear and look for a means of escape while they deal with the Foot. Inadvertantly, Mike springs a trap door in the wall, leading to a hidden room. As Marlin arrives, gunning down the Foot Soldiers to secure his prey, the Turtles flee into the secret passage. They find themselves in a small room where lots of Utrom technology appears to have been salvaged from the TCRI building. Before they can figure things out, Marlin comes bursting through the wall, ready to kill them. Suddenly, a hulking mutant alligator springs from his hiding place and causes Marlin to faint. The gator introduces himself as Leatherhead and explains that he means the Turtles no harm. In fact, he has been watching them since they entered his sewers and, not being humans, he had hoped to speak with them. Leatherhead lays down his origin; that he was once a pet gator that was discarded into the sewers. He was exposed to mutagen from the TCRI building and found by a pair of Utrom guards. They took him in and, as he mutated into an intelligent anthropomorph, kept him around as an equal. Leatherhead would take lengthy trips into the forgotten depths of the sewers though, often leaving for days, and it was during one of these trips that the TCRI building was destroyed and the Utroms escaped from Earth. Leatherhead salvaged what tech he could and has been working on a communication device so that his friends might return for him. Wanting to put some distance between themselves and Marlin, Leatherhead leads the Turtles to a forgotten cave beneath the sewers. Suddenly, Marlin appears behind them, still brandishing his gun. Leatherhead leads the Turtles to an ancient stone bridge spanning an underground river. After crossing, Leatherhead demolishes the bridge with his tail. Unfortunately, the bridge collapses before he can finish crossing and Leatherhead is left dangling on the ledge. Marlin takes aim, but before he can pull the trigger, a throwing knife severs the tendons in his hand and he drops his gun. The knife was thrown by the military officer, who orders Marlin to surrender and come with him into custody for poaching. Marlin tries to back away, but inadvertently stumbles off the cliff, falling into the river below. 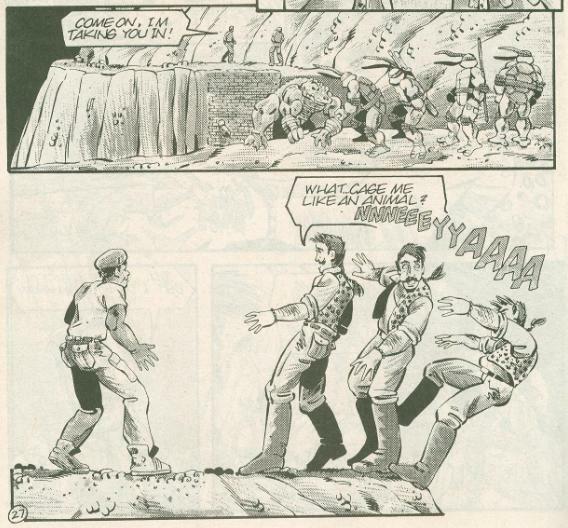 The officer glances across the destroyed bridge and catches a brief glimpse of the Turtles and Leatherhead. Later, the Turtles lead Leatherhead to their old sewer lair. Since Leatherhead’s home has been compromised, they offer to let him live in their former digs. Leatherhead thanks them, as it is a perfect place to continue his work. As the Turtles leave, Mike wonders if they should have made Leatherhead sign a renter’s agreement. Leo sighs. 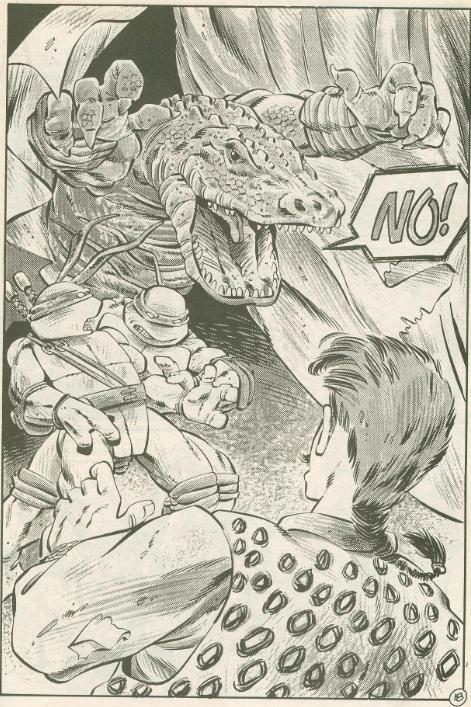 *This story takes place sometime after TMNT (Vol. 1) #21. *The TCRI building was destroyed and the Utroms fled Earth in TMNT (Vol. 1) #7. *The Turtles will meet Leatherhead again in TMNT (Vol. 1) #45. *Unbeknownst to the Turtles, they met Leatherhead as children in Tales of the TMNT (Vol. 2) #38. 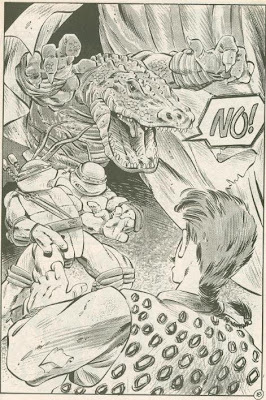 *A decompressed look at Leatherhead’s origin can be seen in Tales of the TMNT (Vol. 1) #50, in the back-up story “Threads”. *Marlin and Officer Emil will return in Tales of the TMNT (Vol. 2) #50. *Leatherhead’s introduction to the Turtles was adapted for the 4Kids TMNT episode “What a Croc”, while the whole “chased by Marlin” plot was used for the episode “Hunted”. *This issue also contained bonus pin-ups of Leatherhead by Jim Lawson, Steve Lavigne, Eric Talbot, Kevin Eastman, Peter Laird and Steve Bissette, as well as a bonus pin-up of Leonardo by Michael Gaydos. The Sensational character-find of 1988: Leatherhead! Or that’s what the issue would have you believe, anyway. Mirage was really, really excited about this guy, who got his own five-page pin-up gallery at the end of the issue. And hey, they should be excited, because Leatherhead would end up being one of the most popular recurring characters of the series, appearing in just about every incarnation of the TMNT franchise (in various degrees of faithfulness). While he isn’t my favorite new character to come out of Tales of the TMNT (Vol. 1), as that honor belongs to the Rat King, I do like Leatherhead quite a bit. His first appearance, though, suffers from some of the same problems I had with the first appearance of Nobody in Tales of the TMNT (Vol. 1) #2. That is, he doesn’t really do anything. He pops out from behind a curtain, causing Marlin to faint, then he talks a lot, then he falls off a bridge, then he goes to live in the old sewer lair. Leatherhead looks awesome and has a fascinating origin and the idea of making him hyper-intelligent instead of a hulking brute was a great twist… but he doesn’t do anything! But even though Leatherhead doesn’t involve himself in much of the issue’s action, there’s still plenty of it to go around. The Turtles getting pinned between Marlin and the Foot Soldiers creates some great tension, and I love the scene where Marlin comes bursting through the wall, shuriken all sticking out of him. A great way of visually showing that he had to gun his way through the Foot Soldiers to get to the Turtles, but without having him tell it to the audience. There are also some superb set-pieces in the issue. I'm fascinated by the idea of hidden caves and forgotten architecture beneath New York’s sewers, something issues like Tales of the TMNT (Vol. 2) #1 have explored. The ancient stone bridge would, in a way, become synonymous with Leatherhead in other offshoots of the franchise. The Turtles fight him on one in TMNT Adventures #6 and his boss battle in TMNT III: The Manhattan Project takes place on the same bridge. As a total nerd, I have one problem with this issue and that’s to do with a contradiction it presents. The Turtles give their lair away to Leatherhead at the end, which creates a huge headache as to just when this story can take place. At a glance, one would think it takes place during the years they lived with April above the antique shop, but the Turtles return to their sewer lair in “Return to New York” with Leaterhead nowhere to be found. And they continue living in their lair for several issues after the fact, again, with Leatherhead nowhere to be found. The only answer is that this story must take place somewhere further down the line, after they leave New York again for an extended stay in Northampton. But even then, the lair is shown to still be trashed by the Mousers. It’s just… a continuity hiccup. Nothing to be done about it. Leatherhead is a character that shines brighter in his subsequent appearances. This issue seems too preoccupied in trying to introduce him that it forgets to allow him to actually do anything but deliver exposition. Be that as it may, I love the set pieces of the story and I can’t hate on anything that includes a battle with the Foot. Interesting observation about Leatherhead and bridges. Although I think you may have your video games mixed up. He isn't in either the Arcade Game or the NES port. He does fight on something like a bridge in The Manhattan Project though. Leatherhead, like many of the great Mirage concepts, strikes me as a lost opportunity. All the house ads leading up to this issue promised a kind of horror-themed character, a monster lurking in the New York sewers. In the actual issue, he scares Marlin but is almost immediately a well spoken ally of the Turtles. While most of the Leatherhead issues are pretty good, I still wish we had gotten something in the flavour of those Steve Bissette ads.